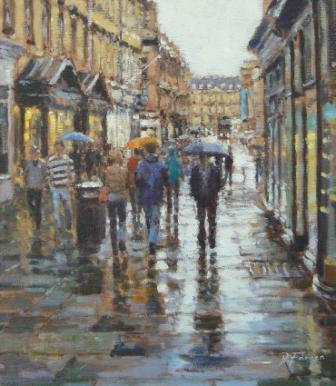 ''Old Bond Street, Bath'' is a good example of David Farren''s skill in producing limited edition prints of vibrant cityscapes. The characteristic Regency architecture of Bath is the backdrop to a busy street scene. Honey-coloured limestone creates warmth on a wet summer day. David Farren creates a snapshot of everyday urban life. We observe but are also involved in the movement and energy he expresses in his cityscapes. His aim is to capture the ambience and individuality of some of the world''s most exciting cities from a street level, concentrating on people as they go about their daily lives. In addition to Red Rag Art Gallery David Farren has exhibited at other leading British Art Galleries. Each limited edition print at Red Rag has been reviewed and signed by David Farren and like all Red Rag British art it can be shipped worldwide. Click here to view more contemporary limited edition prints by David Farren.